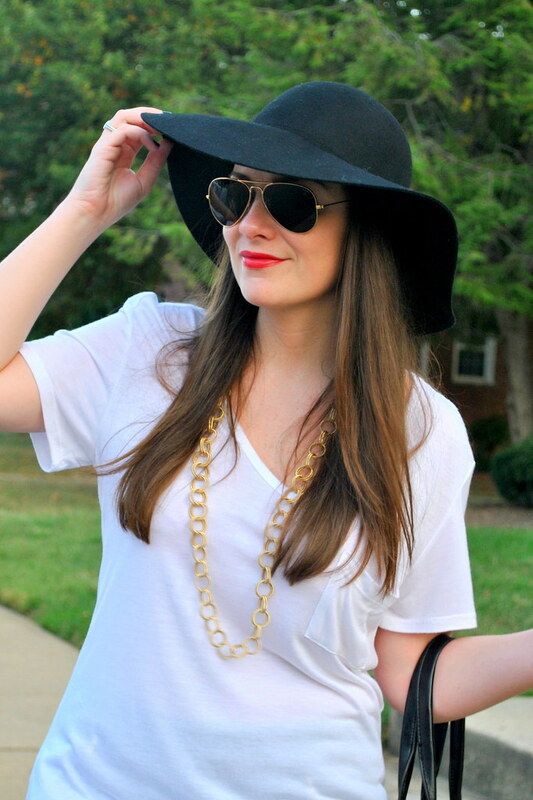 The deets: Nordstrom tee & hat; Express skirt; Forever 21 booties; Ray-Ban sunnies (prescription); Essie "After School Boy Blazer" nails; Giorgio Armani "Four Hundred" lipstick; Steve Madden bag. On the weekends, it's nice to really play with and change up your look. For someone who is always in button downs, pencil skirts, and heels, it almost feels more like I'm "dressing up" when I'm actually dressing down. Also - I know it's totally faux pas for short thicker girls to wear booties that cut off their legs with skirts but frankly, I just don't care! I do what I WANT (sometimes). P.S. Don't forget to enter the Personalized Alphabet Pendant Necklace Giveaway! love love the hat... I have an identical one in maroon that I love to wear! And those booties are F21?! Great find! Honestly, I was prepared to "not like" the top not being tucked into such a gorgeous skirt and I don't... I LOVE THIS ENSEMBLE. Simple, yet fantastic. Perfect for the weekend. I may actually try this myself. I freakin' love your quilted leather skirt ! Me-OW! I love this tougher look on you pretty lady - that quilted leather skirt is everything!